Reading and share top 21 famous quotes and sayings about Specialization by famous authors and people. Browse top 21 famous quotes and sayings about Specialization by most favorite authors. 1. "Imprisoning philosophy within the professionalizations and specializations of an institutionalized curriculum, after the manner of our contemporary European and North American culture, is arguably a good deal more effective in neutralizing its effects than either religious censorship or political terror"
2. "The history of learning amounts to a history of specialization." 3. "The general fact is that the most effective way of utilizing human energy is through an organized rivalry, which by specialization and social control is, at the same time, organized co-operation." 4. "Stars — spectacular representations of living human beings — project this general banality into images of permitted roles. As specialists of apparent life, stars serve as superficial objects that people can identify with in order to compensate for the fragmented productive specializations that they actually live. The function of these celebrities is to act out various lifestyles or sociopolitical viewpoints in a full, totally free manner. They embody the inaccessible results of social labor by dramatizing the by-products of that labor which are magically projected above it as its ultimate goals: power and vacations — the decisionmaking and consumption that are at the beginning and the end of a process that is never questioned. On one hand, a governmental power may personalize itself as a pseudostar; on the other, a star of consumption may campaign for recognition as a pseudopower over life. But the activities of these stars are not really free, and they offer no real choices." 5. "Intelligence augmentation decreases the need for specialization and increases participatory complexity." 6. "Here we see the word "brain" occurring for the first time in human speech, as far as it is known to us; and in discussing injuries affecting the brain, we note the surgeon's effort to delimit his terms as he selects for specialization a series of common and current words to designate three degrees of injury to the skull indicated in modern surgery by the terms "fracture", "compound fracture," and "compound comminuted fracture," all of which the ancient commentator carefully explains." 7. "At this point in history, our society tends to elevate and reward the specialist...This concentrated focus has brought some benefits...It may also be a modern malady. Specialization, when taken too far and allowed to define who and what we are, becomes limiting. It robs us of our wholeness and our self-sufficiency. It misses the big picture and confines us to a narrow zoom. And it leaves us at the mercy of experts." 8. 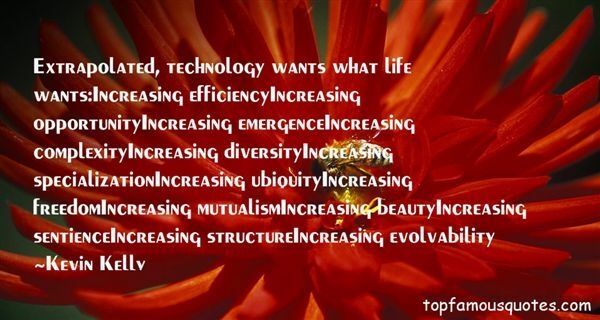 "Extrapolated, technology wants what life wants:Increasing efficiencyIncreasing opportunityIncreasing emergenceIncreasing complexityIncreasing diversityIncreasing specializationIncreasing ubiquityIncreasing freedomIncreasing mutualismIncreasing beautyIncreasing sentienceIncreasing structureIncreasing evolvability"
9. "Only by strict specialization can the scientific worker become fully conscious, for once and perhaps never again in his lifetime, that he has achieved something that will endure. A really definitive and good accomplishment is today always a specialized act." 10. "Well, in a world where so few of us are obliged to cook at all anymore, to choose to do so is to lodge a protest against specialization—against the total rationalization of life. Against the infiltration of commercial interests into every last cranny of our lives. To cook for the pleasure of it, to devote a portion of our leisure to it, is to declare our independence from the corporations seeking to organize our every waking moment into yet another occasion for consumption. (Come to think of it, our nonwaking moments as well: Ambien, anyone?) It is to reject the debilitating notion that, at least while we're at home, production is work best done by someone else, and the only legitimate form of leisure is consumption. This dependence marketers call "freedom." 11. "These examples suggest what one needs to learn to control attention. In principle any skill or discipline one can master on one's own will serve: meditation and prayer if one is so inclined; exercise, aerobics, martial arts for those who prefer concentrating on physical skills. Any specialization or expertise that one finds enjoyable and where one can improve one's knowledge over time. The important thing, however, is the attitude toward these disciplines. If one prays in order to be holy, or exercises to develop strong pectoral muscles, or learns to be knowledgeable, then a great deal of the benefit is lost. The important thing is to enjoy the activity for its own sake, and to know that what matters is not the result, but the control one is acquiring over one's attention." 12. 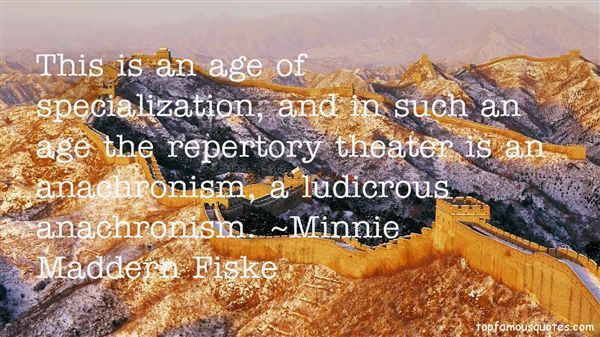 "This is an age of specialization, and in such an age the repertory theater is an anachronism, a ludicrous anachronism." 13. "A specialist's mind is a slave to his specialization." 14. 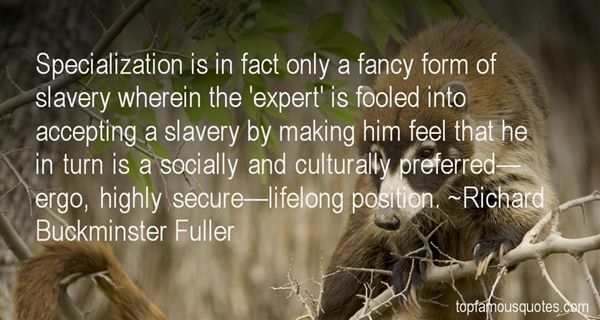 "Specialization is in fact only a fancy form of slavery wherein the ‘expert' is fooled into accepting a slavery by making him feel that he in turn is a socially and culturally preferred—ergo, highly secure—lifelong position." 15. "Of course, I am interested, but I would not dare to talk about them. In talking about the impact of ideas in one field on ideas in another field, one is always apt to make a fool of oneself. In these days of specialization there are too few people who have such a deep understanding of two departments of our knowledge that they do not make fools of themselves in one or the other." 16. "A human being should be able to change a diaper, plan an invasion, butcher a hog, conn a ship, design a building, write a sonnet, balance accounts, build a wall, set a bone, comfort the dying, take orders, give orders, cooperate, act alone, solve equations, analyze a new problem, pitch manure, program a computer, cook a tasty meal, fight efficiently, die gallantly. Specialization is for insects." 17. "The modern spirit is a hesitant one. Spontaneity has given way to cautious legalisms, and the age of heroes has been superseded by a cult of specialization. We have no more giants; only obedient ants." 18. "Too rigid specialization is almost as bad for a historian's mind, and for his ultimate reputation, as too early an indulgence in broad generalization and synthesis." 19. "It is of course no secret to contemporary philosophers and psychologists that man himself is changing in our violent century, under the influence, of course, not only of war and revolution, but also of practically everything else that lays claim to being "modern" and "progressive." We have already cited the most striking forms of Nihilist Vitalism, whose cumulative effect has been to uproot, disintegrate, and "mobilize" the individual, to substitute for his normal stability and rootedness a senseless quest for power and movement, and to replace normal human feeling by a nervous excitability. The work of Nihilist Realism, in practice as in theory, has been parallel and complementary to that of Vitalism: a work of standardization, specialization, simplification, mechanization, dehumanization; its effect has been to "reduce" the individual to the most "Primitive" and basic level, to make him in fact the slave of his environment, the perfect workman in Lenin's worldwide "factory." 20. "Helping teacher leaders come to understand their gifts is the first step in developing a specialty. Some leaders are great coaches and should focus on instructional leadership in a district or network where that is valued and supported. Great conceptual thinkers are good in startup mode but the daily grind of leading a school doesn't suit them. Other leaders thrive on the turnaround challenge. The dynamic blended future of education will allow more role specialization." 21. "Reality is a very subjective affair. I can only define it as a kind of gradual accumulation of information; and as specialization. If we take a lily, for instance, or any other kind of natural object, a lily is more real to a naturalist than it is to an ordinary person. But it is still more real to a botanist. And yet another stage of reality is reached with that botanist who is a specialist in lilies. You can get nearer and nearer, so to speak, to reality; but you never get near enough because reality is an infinite succession of steps, levels of perception, false bottoms, and hence unquenchable, unattainable. You can know more and more about one thing but you can never know everything about one thing: it's hopeless. So that we live surrounded by more or less ghostly objects— that machine, there, for instance. It's a complete ghost to me— I don't understand a thing about it and, well, it's a mystery to me, as much of a mystery as it would be to Lord Byron." God knows I've got so many frailties myself, I ought to be able to understand and forgive them in others. But I don't."